*musing* How do you write a review of what is essentially the perfect book? I'm still not sure, but I imagine it might involve word vomit and maybe some made up words. Reading this book was like going to the dentist and letting him have at it without any Novocaine. Before anyone jumps in with horrified gasps, let me explain: this is the kind of book that rips you to shreds and doesn't apologize while doing it. It destroys you and doesn't even try to put you back together. And somehow, that's ALL RIGHT. I can't explain it. I LIKED being torn into pieces. I LOVED being so completely and utterly broken. It means that the book did its job. Brilliantly, I might add. 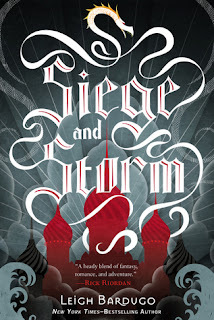 Leigh Bardugo just has this way with words that makes you beg to be ruined and then ruined some more. 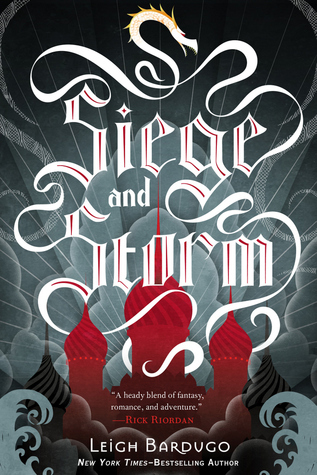 I was an emotional wreck after reading Siege and Storm. More so than with any other book I've read in recent memory, and there have been some doozies (Grave Mercy and Dark Triumph stand out as other emotional roller coasters). The difference with the others was that they ended on a high note and with such hope. I felt no hope at the end of SIEGE AND STORM. None. Why then, am I giving this book my highest rating and wishing that there were more stars in the universe to award it? Why am I calling it 'the best book of the year' and my new very most favorite book? Because I don't think we were SUPPOSED to feel hope at the end of this book. I believe we were supposed to be devastated and ruined and broken and annihilated and in little teensy pieces. Because I think we can relate better to Alina that way. We can understand a bit of what she's going through and where she's been and where she's going. We start to know why she's so devastated at the end and what she's lost. We can feel a tiny bit of empathy for her because we've been demolished as well. The world she's living in starts to make a little more sense once we understand to a small degree the range of emotions she's going through. Then there's the Darkling. THE DARKLING! I'm a little hooked obsessed madly in love drawn to him. There's something SO attractive about the ultimate bad boy. This guy really IS. He's got the history to back it up. The thing I find so appealing about him is that there's something in him that makes me believe he's looking to be redeemed. I know, I know. Hear me out though. Sure, he's totally power-hungry and wants to control Ravka and the entire world. I get that. BUT, he seeks out the one person who can theoretically stop him and makes her MORE POWERFUL. He essentially GIVES her the power to stop him. In my mind, he's begging her to make him more than just the resident bad guy. At any rate, that's what I'm sticking to. If you really must know, I love every single aspect of this book. Love, love, love. There aren't enough stars in the universe to express that really, though that sounds quite suspiciously like I've been dabbling in hyperbole. It's NOT. I think this might be my new very most favorite book EVER. Truly. I am dying a little bit inside that I don't have the final book yet.